Pool Party Swimming Pool Interior Surfaces - All Tile or Pebble? Swimming Pool Interior Surfaces – All Tile or Pebble? It can be hard to decide what you want to do when it comes to the interior surface of your swimming pool. Today, all tile and Pebble Tec are very popular swimming pool surfacing options. When it comes to choosing tile for your pool, there are porcelain, glass, ceramic and stone, with all sorts of styles, colors and, variations to choose from. Glass tile is the primarily used type of tile for pool surfacing as it has the best aesthetic appeal and durability. With Pebble Tec, there are many different colors to choose from, selecting the color will depend on personal taste and what will go best with your backyard oasis. Which one should you choose? Pebble surfaces are all the rage when it comes to interior pool surfaces of custom-built swimming pools. If you are looking to have an oasis in your backyard or update your current oasis, and you are looking for low maintenance, using pebble finishing on your pool’s surface is a great option. Why Pebble Surfaces are taking Over Swimming Pool Surfaces? For starters, pebble surfaces have a much longer lifespan than most other pool surfacing options. It is nonporous, which means, it doesn’t absorb pool chemicals, resists algae growth and staining. Plaster requires more maintenance than pebble finishing since it is porous, develops visible stains much easier, and has a shorter overall lifespan. What is a Pebble Surface? A pebble surface is a mixture of hydraulic cement and polished stone pebbles. The finishing goes on after the concrete is applied to the pool. The mixture is applied pneumatically, then hand-wiped or water-blasted to reveal the top layer of pebbles. The color may range from the lightest white to the darkest black and everything in between. Sometimes, it can be a bit overwhelming for the homeowner to choose. Some colors can be cool and modern, or bright and summery. It is also important to keep in mind that the texture of the pebble also plays an important role in the decision. The smaller the pebbles, the better; this means that your feet are less likely to get scrapped or hurt, plus, it has an anti-slip and stain resistant surface. Pebble surfaces offer a unique design that fits nicely into an overall design scheme. The advantage is that it creates a natural oasis feel to your backyard, and it can help tie into a home’s overall design. Negative-edge pools, spa spillways, beach entries, and elaborate water features, are designs that serve as inspiration for a stunning tile. The most used swimming pool tile types include glass, natural stone, and ceramic and porcelain. If you are looking to have a classical or Mediterranean style oasis, a stone tile will give you just that; a natural look and textured feel that goes perfectly on a patio or deck. When combined with the coping, the appearance is more unison. Stone tile design elements include flagstone, travertine, slate, sandstone, bluestone, and semi-polished granite tile that displays a pepper tone look. 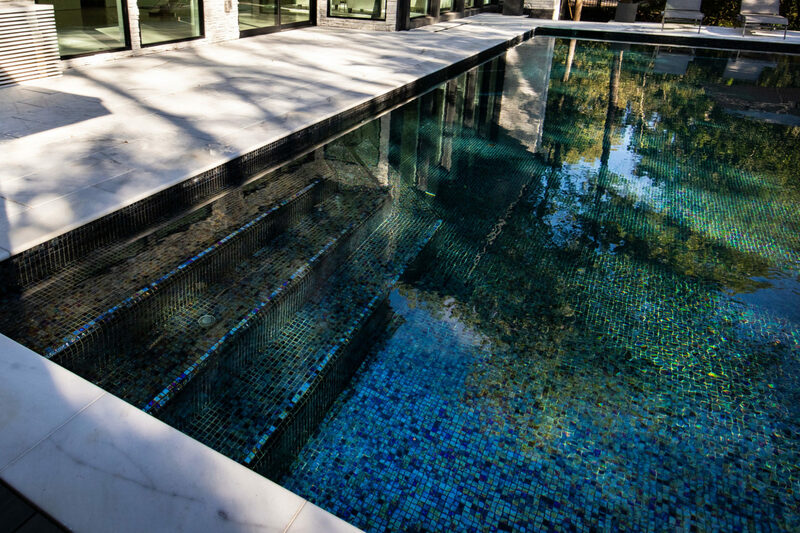 Ceramic and porcelain tiles have been staples of pool finishing for decades. Contrary to glass tiles, these are hand-painted with exciting designs, or they go into a mosaic mode. Nowadays, you can find them in a textured version that goes well with a surrounding landscape. There is also a texturized-glazed porcelain tile that is bolder and more exciting, giving a punch to a swimming pool border. In recent years, the popularity of glass tiles on swimming pools is on the up. Glass tile is the most durable and non-porous of all tile types. It goes great with the transparent nature of water. Their ingredients make it able to shape it into practically anything. Glass tiles come in a small – mosaic format. It has the advantage to cover curved surfaces completely. The pool designer can also mix colors, creating a color scheme and thus, form an artwork. The quality of glass tile can vary greatly. However, the reflections are often brilliant underwater regardless of the quality of the glass. Some glass tiles have an iridescent coating that shimmers with the change of light and water flowing over the surface. The artistic look and feel of a finished installation are more significant and dynamic with an upscale glass tile. Glass tiles have better optical quality than the rest. The shine, color, and depth are more exciting than the look of small mosaic designs. In all-tiled pools and spas, the overall effect of glass is mesmerizing, and as waterline borders and step-markers, the internal reflections offer a gem-like luster. In the long run, pebble and glass tile surfaces save you time and money because they are stain resistant, anti-slip and non-porous. The advantage of glass tiles is that it resists humidity, temperature changes, and chemical products. Due to this, you don’t have to brush the surface that often. However, calcium build-up may happen if you do not keep proper chemical maintenance. We always recommend checking the water’s chem balance twice a week and ensure that the total balance is between 7.4 and 7.5. Water chemistry can lead to scale build-up, which in some cases, leads to needing to drain the pool in order to remove the build-up.